A survey conducted at the Joint Multi-Conference on Human-Level Artificial Intelligence shows that 37% of respondents believe human-like artificial intelligence will be achieved within five to 10 years. Human-like AI, or artificial general intelligence (AGI), would occur when a machine can perform any cognitive task that a human can. Although computers can outperform us in some narrow tasks, no one AI can outperform humans on a wide variety of general cognitive tasks. Not all experts believe we're close to AGI. But most agree the field has been making significant progress, especially in recent years. Artificial intelligence is integral to daily life in the developed world. We use AI when we order an Uber, sift through our email account's spam folder, or browse our news feeds. Beyond the world of apps, we can see dazzling examples of AI beating Go and chess masters, composing music, and identifying diseases in patients where human doctors found none. But these are examples of weak AI, not strong AI, which is also called artificial general intelligence (AGI). An AGI is a machine that can perform any cognitive task that a human can. AGI has long been a primary goal of AI researchers. It's the subject of countless works of science fiction, such as HAL 9000 in 2001: A Space Odyssey and Ava in Ex Machina, and the development of an AGI would likely result in a computer that could finally pass the Turing test, in which a computer must prove its intelligence is equivalent to, or indistinguishable from, a human. So, will we ever see AGI? If so, when? The answer is yes and within five to 10 years, according to 37% of respondents to a survey issued at the Joint Multi-Conference on Human-Level Artificial Intelligence (HLAI) held last month in Prague. The survey, which was conducted by the AI startup SingularityNET and the AI research and development company GoodAI, found that 28% of respondents expected AGI to emerge within the next two decades while just 2% didn't believe humans will ever develop AGI. "It's no secret that machines are advancing exponentially and will eventually surpass human intelligence," said Ben Goertzel, SingularityNET's CEO and creator of the software behind a social, humanoid robot named Sophia. "But, as these survey results suggest, an increasing number of experts believe this 'Singularity' point may occur much sooner than is commonly thought. Artificial general intelligence at the human level or beyond, as many respondents to our poll noted, could very well become a reality within the next decade." A 2016 survey of AI researchers who had been published in top peer-reviewed journals found slightly less exciting results. The survey asked respondents to rate how many years it would be before AI possessed "high-level machine intelligence," which they defined as being "achieved when unaided machines can accomplish every task better and more cheaply than human workers." The respondents were asked about specific AI milestones, such as when AI would be outperform humans in complex tasks like surgery. Timelines showing 50% probability intervals for achieving selected AI milestones based on survey respondent opinions. Specifically, intervals represent the date range from the 25% to 75% probability of the event occurring. 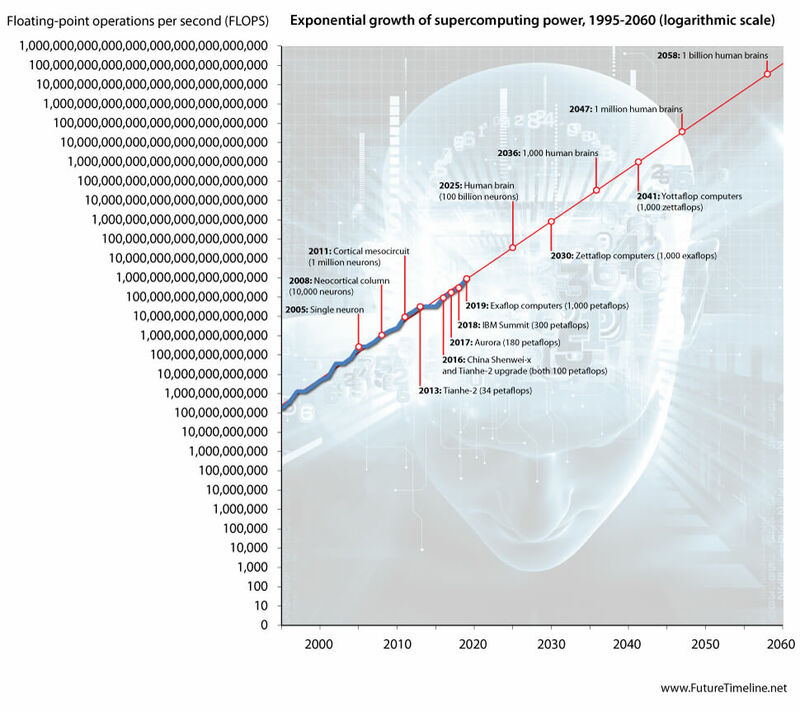 Circles denote the 50%-probability year that AI will achieve or exceed human performance. The survey paper concludes with researchers suggesting that, though there are many reasons to be optimistic about developments in AI, researchers in the field are sometimes no better at predicting the future than crude statistical representations. Some experts who attended the recent HLAI conference voiced similar caution. "At the moment, there is absolutely no indication that we are anywhere near AGI," Irakli Beridze, Head of the Centre for Artificial Intelligence and Robotics, told Futurism. "And no one can say with any kind of authority or conviction that this would happen within a certain time frame. Or even worse, no one can say this can even happen period. We may never have AGI, so we need to take that into account when we are discussing anything." Still, there are a few trends helping to propel the development of AGI. These include, as AI venture capitalist Matt Turck detailed in a recent blog post, increased access to AI tools and education, an uptick in AI research in major internet companies like Google and Facebook, the ever-increasing amount of available data with which researchers can train AI, massive accelerations in computing power, and progress in quantum and optical computing. But, ultimately, only time will tell.